View of Parcel 2 residential and Wharf Center from the Transit Pier. View of Parcel 2 residential and Wharf Center from Maine Avenue. Parcel 2 is located approximately where Phillips Flagship now stands, to the west of 9th Street. 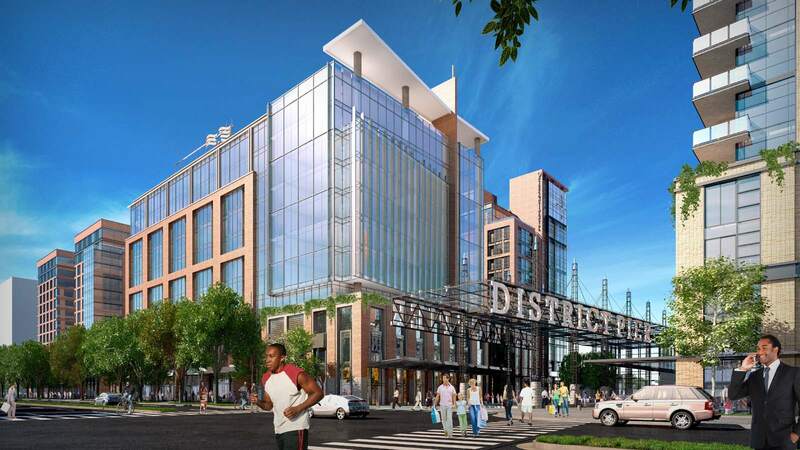 In its place will be The Wharf Center, a 135,000 SF multipurpose entertainment and cultural venue. Presumably this is where the Washington Kastles will play their matches. Wrapped around it will be 494 apartment units in two towers (292 units in the east tower and 202 units in the west tower), and 39,000 SF of ground floor retail. 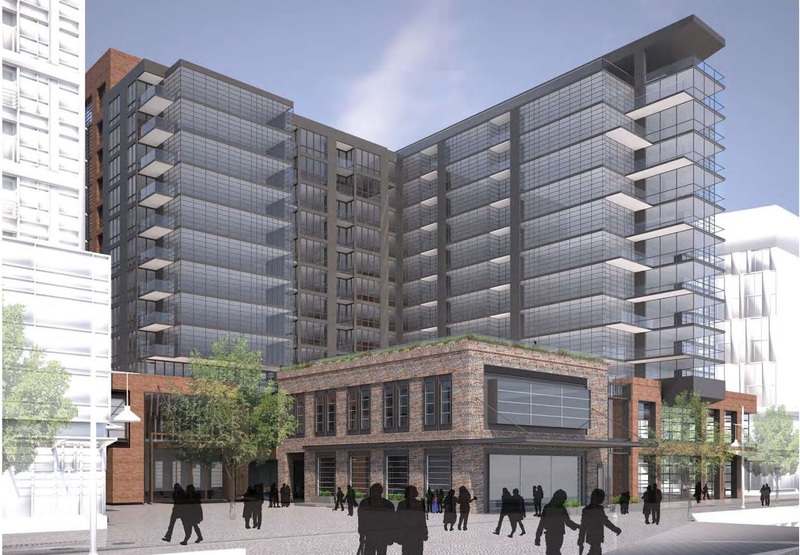 In addition, there will be a Combined Heating and Power Facility (CHP) that will provide all the necessary heating, cooling, and electrical power sources for The Wharf northwest of 7th Street. The Wharf Center will be a five-level facility while the residential buildings will rise 12 stories to a height of 130 feet. An unoccupied tower at one corner of the building facing the District Pier will reach 200 feet. The residential buildings will be made with brick, stone cladding, precast concrete, composite metals, glass, and a painted aluminum curtain wall system. Hoffman-Madison Waterfront will develop this parcel and the architect is Perkins Eastman. View of Parcel 3a office building from Maine Avenue. Parcel 3a is located approximately where the Kastles Stadium at The Wharf is currently located, to the east of 9th Street. 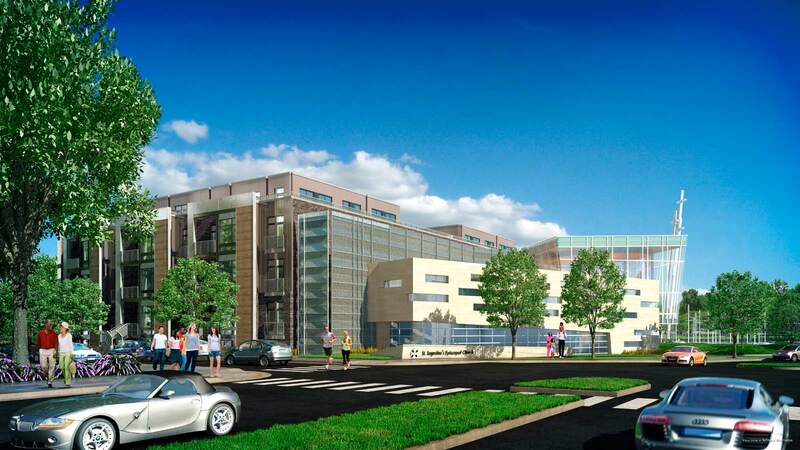 The Graduate School USA will occupy the 11-story, 218,000 SF office building (at a height of 130 feet) facing Maine Avenue and there will be 15,000 SF of ground floor retail. A 170-foot unoccupied tower element will be in one corner of the building. Building materials include brick, limestone, composite metal, glass, and a painted aluminum curtain wall system. Hoffman-Madison Waterfront will develop this parcel and the architect is Perkins Eastman. 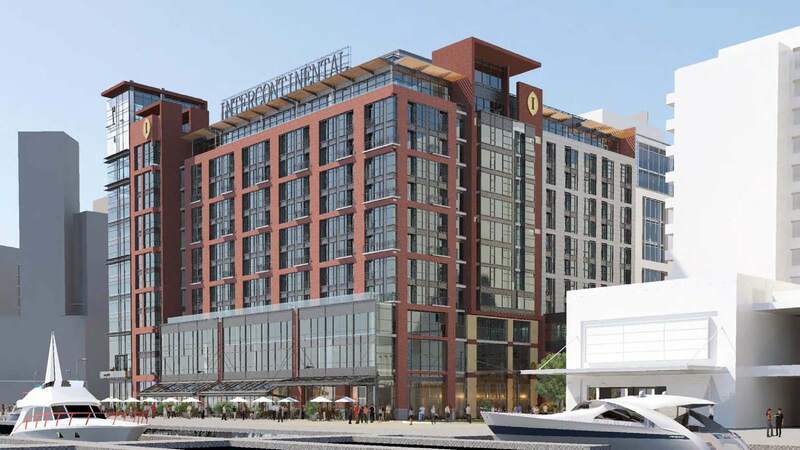 View of Parcel 3b InterContinental Hotel from Wharf Street promenade. Parcel 3b is located to the south of parcel 3a and faces the Washington Channel. a 278-key InterContinental Hotel (the other InterContinental Hotel in the city is The Willard) is planned at this location along with 7,000 SF of retail. 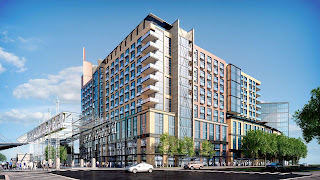 The hotel will rise 12 stories reaching 130 feet with a clock tower at one corner approximately 159 feet in height. Construction materials include red & gray brick, terracotta, tinted glass, granite, metal, and concrete. Carr Hospitality will develop this parcel and the architect is BBG-BBGM. View of Parcel 4 residential from Wharf Street promenade. 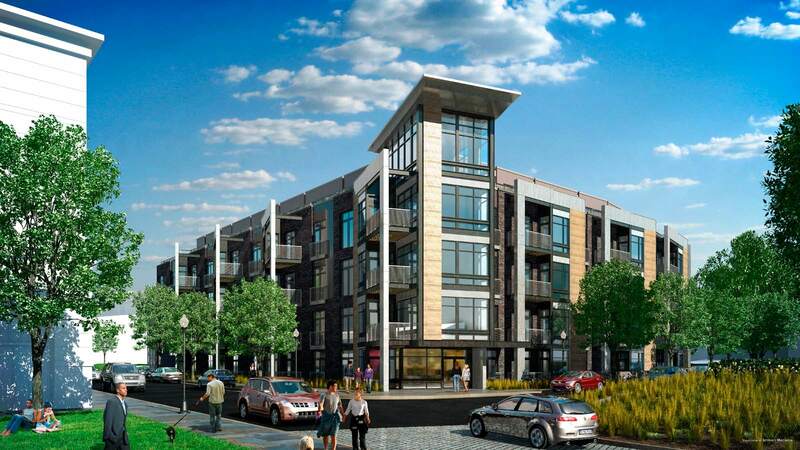 View of Parcel 4 residential from Maine Avenue. Parcel 4 is also located somewhat in the Kastles stadium footprint and will contain 168 apartments and 130 condos in two buildings. There will be 77,000 SF of retail in two levels, including a health club. 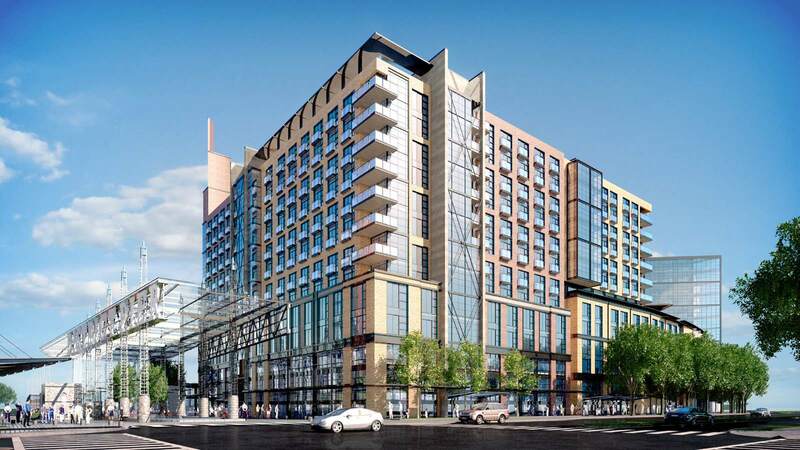 The apartments and condos will rise 13 stories and reach a height of 130 feet. 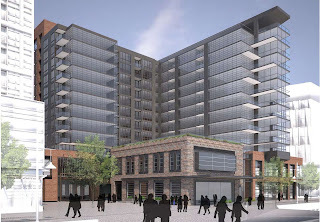 These buildings will have more of an industrial feel and sort of remind me of The Odyssey condos in Arlington (at least the perspective from Wharf Street). 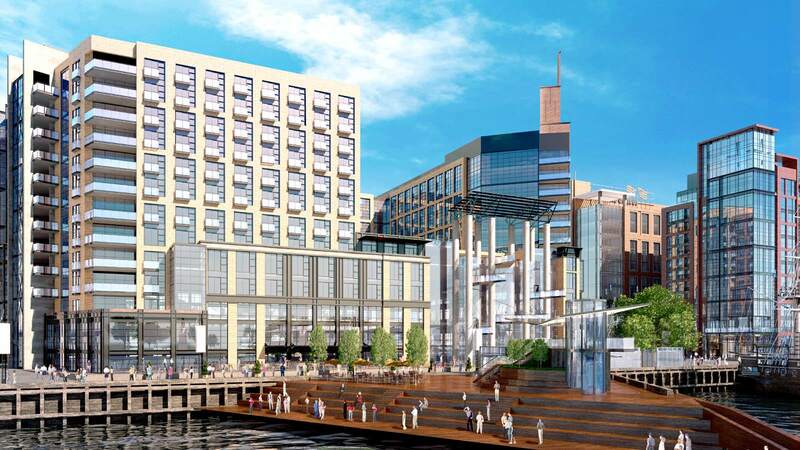 Hoffman-Madison Waterfront will develop this parcel and the architect is Handel Architects. View of Parcel 11a St. Augustine's Church from M Street. View of Parcel 11a St. Augustine's Church from Maine Avenue. Parcel 11a is the site of St. Augustine's Episcopal Church at 6th Street and Maine Avenue. 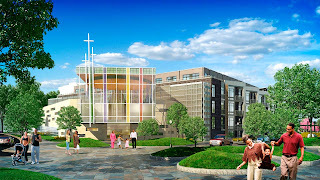 The old church will be demolished and in its place will be a new, 15,000 SF facility as rendered above. It will be two stories and will include building elements such as blue & gray glass, cast stone, mill finish aluminum screen, and white aluminum storefront. St. Augustine's will develop this parcel and MTFA Architecture is the designer. View of Parcel 11b condos from the Waterfront Park. 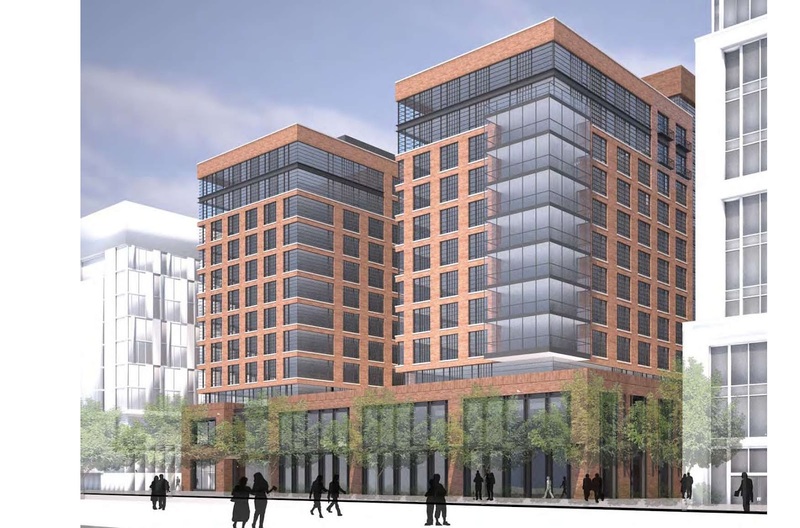 Adjacent to St. Augustine's will be a 109-unit condo building at parcel 11b. The 5-story condo will be U-shaped and will line 6th Street. Building materials include brick, metal panels, stone, wood, and glass. Hoffman-Madison Waterfront will develop this parcel and the architect is SK&I Architectural Design Group. 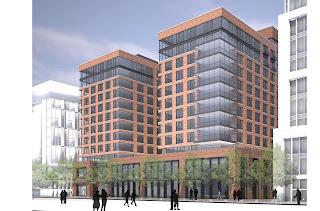 There will be a public presentation on February 27 at 6pm at Arena Stage and Hoffman-Madison Waterfront will most likely meet with the Zoning Commission in July. 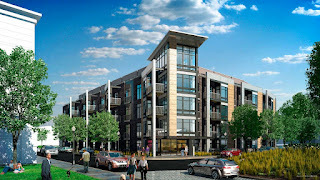 Groundbreaking is now scheduled for the first quarter of 2013 with phase one opening in 2015. What are your initial thoughts on the Stage 2 application? Thanks for keeping us up to date with this. This is awesome. Can't wait for the meeting. Too bad the development is now pushed back even further. Is St. Augustine's going to occupy their parcel? I'm not a religous person, but I do love architecture. And maybe I didn't read into previous information, but demolishing St. Aug's and replacing it with some fugly glass box is horrible. a 12 story structure? sayonara views for those of us that live at tiber, carrolsburg and waterside towers. 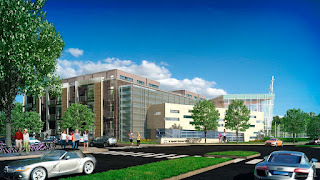 and those of us that are tiber and carrolsburg, have to deal with this monstrosity that is going in the st aug's site. property values for those of us in the lower level of tiberi's west tower, and those of us in the tiber island condos that line 6th street just dropped since we have no view now.